350P AED- Standard - SHIPS FREE! 350P AED- AVIATION - SHIPS FREE! Defibrillators can make a life and death difference when someone has sudden cardiac arrest. 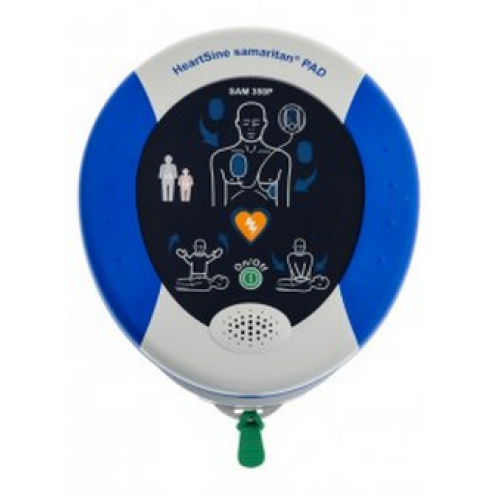 With a Samaritan® Pad 350P defibrillator, by HeartSine, a first responder has a dependable tool at their disposal that is easy to understand and deploys fast-acting electric pulses to restart the heart. 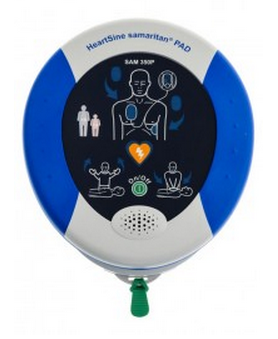 The Samaritan defibrillator is their flagship device designed for use in public areas as well as clinical. Diverse and light, this machine will deliver electric pulses appropriate for both adult and child. HeartSine developed what they call SCOPE technology within the Samaritan® Pad 350P. This built-in software instructs the machine to utilize a low-energy waveform that analyzes the patient's heart rhythm prior to delivering the jolt of energy to restart the heart. The software also indicates when to administer defibrillation, when to stand clear, and when it is safe to touch the patient. The user has simple commands to operate with the two-button operation: On/Off and SHOCK. The Samaritan® Pad 350P -Aviation provides a safety data sheet for the device to be taken on an airplane showing it's TSA approved. The Samaritan® Pad 350P has electro pads made for adult and child and deliver the proper amount of electric stimulation. This defibrillator utilizes two distinct pads -- one for adult and one for children. The Pad-Pak is for adult patients, while Pediatric-Pak would be to administer electric shock for children 8 years or younger, or those who are less than 55 lbs. The adult pads are colored gray and the pediatric pads are pink. The Pad-Pak™ cartridge combines both the battery and electrode pads. This provides significant savings over other defibrillators that require a seperate battery and electrode replacements. In addition, there's a four-year shelf life from the date of manufacture. The cartridges provide savings and only one expiration date to monitor. The defibrillator is light and easy to deploy. The 2-button interface makes using the product simple. The defibrillator can use different charge amounts for adults and children. The software in the machine will use a low-energy waveform to monitor the patient's heart rhythm. The machine is light, small and comes with a tote bag for transportability. The display face indicates when to stay clear, when it's safe to touch the patient, and when to initiate the shock. Method: Evaluates patient's ECG, signal quality, electrode contact integrity and patient impedance to determine if defibrillation is required. Temporary Transportation Temperature: 14F to 122F (-10C to 50C) for up to two days. Unit must be returned to standby/operating temperature for 24 hours before use. Samaritan PAD 350P: ABS, Santoprene. Printed circuit board with electronic components.